Native American Ministries Sunday, one of six special Sundays in The United Methodist Church, will be celebrated on April 19. Observed on the third Sunday of Easter, this special Sunday celebrates the gifts, contributions and ministries offered by and with Native Americans to our church and society. It was first celebrated in 1989 as Native American Awareness Sunday. United Methodists are encouraged to celebrate Native American Ministries Sunday in consultation with representatives of the Native American community in their region. Such a service should respect the traditions of the native peoples, and may be a service of repentance and reconciliation between indigenous and immigrant peoples. 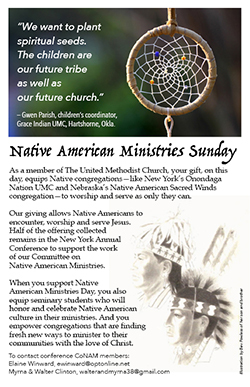 There are 149 Native American UM churches, including the Onondaga Nation UMC just south of Syracuse, N.Y.
An abundance of resources for this Sunday can be found at www.umcgiving.org/ministry-articles/native-american-ministries-sunday. Click here for inserts that you may print (in color or black and white) and use in your bulletins on Sunday, April 19. Myrna and Walter Clinton: By phone at 203-934-1316, or email, walterandmyrna38@gmail.com. Elaine Winward: By phone at 914-669-5264, or email, ewinward@optonline.net. Elaine is a member of Jesse Lee Memorial UMC in Ridgefield, Conn. Her husband, Dan Winward, is half Mohawk, and has cousins who are active in the Onondaga Nation in Nedrow, N.Y. The CoNAM will be holding its annual meeting on October 8-10 at the Edith Macy Conference Center in Briarcliff Manor, N. Y. All those interested in Native American ministries and issues are encouraged to attend. Church offerings should be sent by mail to the NYAC via with your other church remittances. Online donations can be made at www.umcgiving.org. Thanks for your commitment to these efforts.